Before presenting suggestions to the user we need to collect the data determining which searches are popular. This data contains the most likely choice of search term given a prefix (i.e., an incomplete search term). For example, given the incomplete search term ne we need to return the most frequent searches that have been made using that prefix. Suppose the user searches for the term Netflix. Given the search term we increment the frequency of a (prefix, search term) tuple for each prefix of the search term Netflix. The end result is a datastore model with entries for each (prefix, search term) tuple. 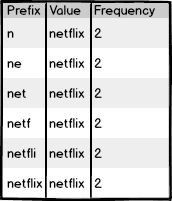 If that term Netflix is searched for a second time we increment the frequency count of each (prefix, search term) tuple. Now suppose one person searched for the term news. We build up our frequency table with each (prefix, search term) tuple again, using news as the search term. Once we’ve assembled the data we can go back to our original problem of finding the most likely searches for a given incomplete search. Given our dataset this is lookup for each record matching our prefix in the dataset ordered by frequency. The following is a sample implementation encapsulating the ideas presented above.
""" Model class for scoring of search frequency. """ """ Builds a key in the default namespace. """ """ Return all models with the matching prefix. Ordered by frequency. """